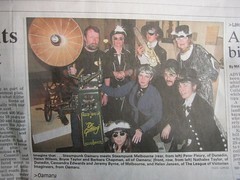 There will be no New Year's Eve ALTV event in 2012. It has been four weeks now since Euchronia wired us all into this second decade of the 21st Century in a whirl of lightning, flame, music and dance. On behalf of the League, we congratulate and extend sincerest thanks and appreciation to everyone who took part in this entirely extraordinary New Year’s Eve party. 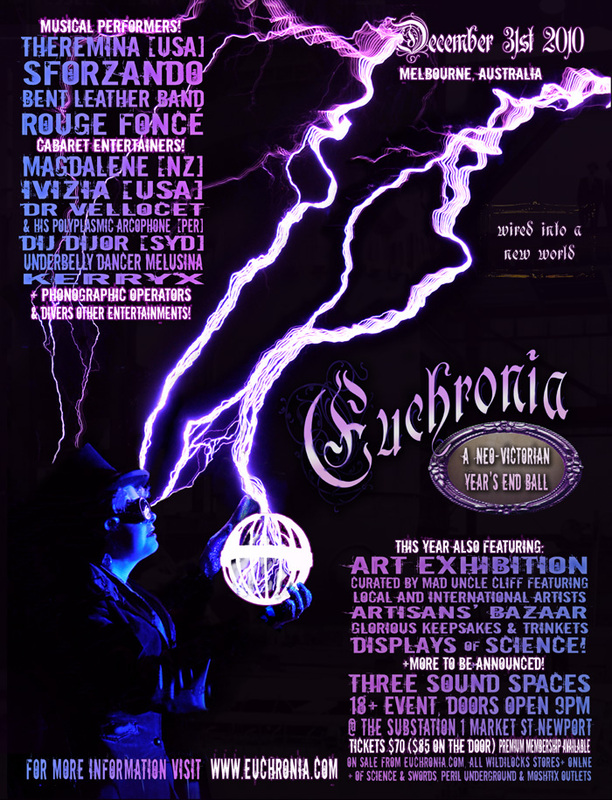 How we made the Euchronia 2010 Tesla coil poster image - a world first for steampunks! Gosh, it's now less than a month til Euchronia! As in 2008, we've had so many compliments on our 2010 Euchronia poster we felt some information on how it was created would be of interest, even more so than last time. Only 24 hours left for Euchronia presale tickets! Tally Ho! Only 24 hours left on pre-sale Euchronia tickets - get them before the price goes up! >> http://www.euchronia.com/tickets - we will be posting out al presale tickets at the same time this week, so don't worry if you haven't received yours yet! Standard release will be available at a variety of ticketing outlets from late this week, we will update when we have outlets confirmation. 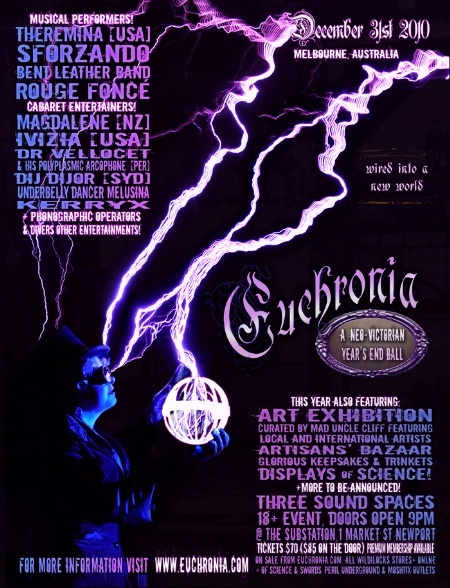 Euchronia Pre-sale extended by 1 week - plus a NEW steampunk/goth event for Wellington! Pre-release tickets for Euchronia 2010 have been selling like astonishingly fast-selling things! We've managed to catch some folks a little on the hop however, as certain corners of the Internet are only now learning that Euchronia will be happening again this New Year's Eve. In order not to disadvantage these benighted souls, we have decided to extend the pre-release period for one additional week.